The QUICK TURN NEXUS (QTN) 500 turning center with a large spindle bore packs the speed, power and precision that’s required for the heavy-duty machining of long, large workpieces, especially those produced for the energy and heavy equipment industries. 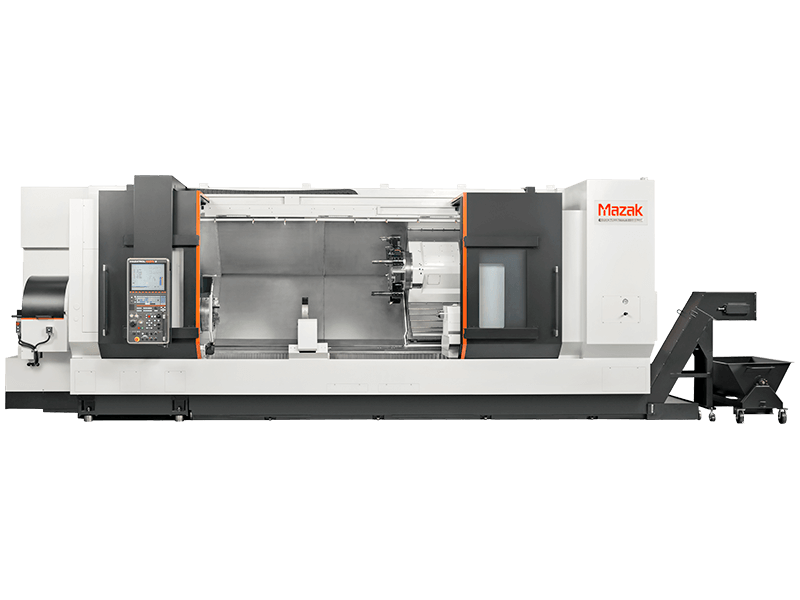 As a two-axis configuration in the QUICK TURN NEXUS Series, the machine provides efficient part processing and features a gear-driven spindle headstock, a massive turning turret and CNC programmable tailstock. And Mazak’s MX Hybrid Roller Guide System ensures optimum vibration dampening, extended tool life and the shortest possible cycle times through fast acceleration/deceleration speeds. Additionally, the QTN 500 pairs with an optional, highly unique tailstock design that combines a standard tailstock with a long boring bar (LBB) to achieve deep-hole boring depths of 46". Spindle through-bore diameter size of 7.2"